Maximum heating temperature of 114 degrees Fahrenheit. 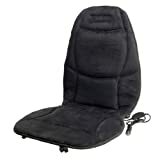 Wagan 12 Volt Velour Heated Seat Cushion with Lumbar Support is a great companion for cold winter days. Super soft velour and polyester feel luxurious and provide ultimate comfort and warmth. Easy to use – simply plug into your vehicle’s 12 volt outlet. Features a high/low/off switch so you can control the heat setting. Maximum heating temperature is 114 degrees Fahrenheit. Also features lumbar support for the lower back. Powered by 12 volt DC. DC cord is 4.3 feet. Straps in the back of the cushion to hold the cushion in place and secure it to your seat. Light and portable so it is convenient to take from one car to another. Enjoy soothing heat in the comfort of your vehicle. An optional AC adapter is available for home and office use (Wagan item number 9903 AC adapter).